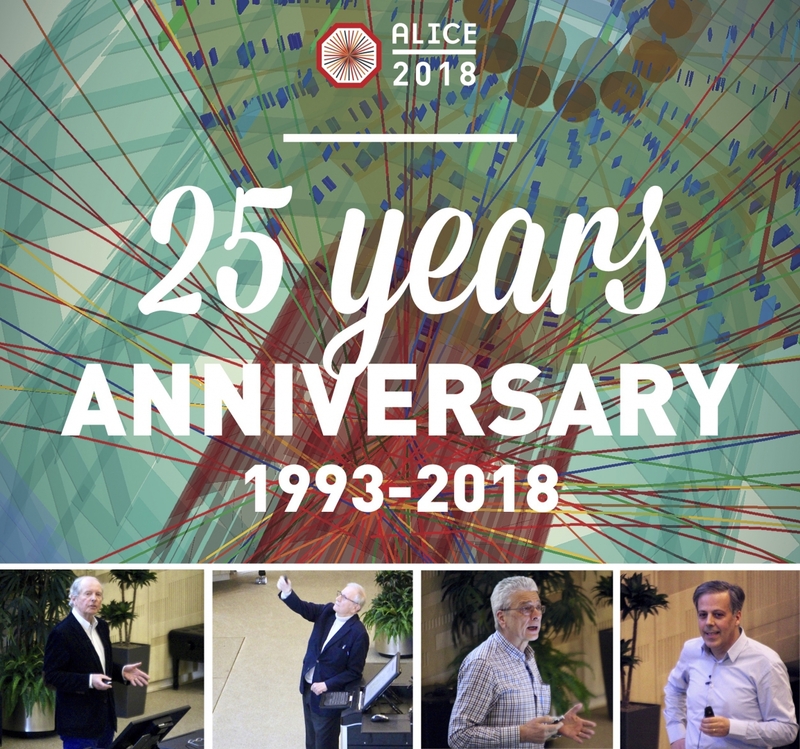 CERN Alumni | Happy 25th birthday, ALICE! The ALICE collaboration celebrated its 25th anniversary at a jubilee event on 21 March. The well-attended event was an occasion to share personal recollections of the first days of the experiment and retrace the milestones of its history. On 1 March 1993, the recently formed ALICE collaboration submitted a letter of intent to the CERN LHC Committee, proposing the construction of a heavy-ion experiment dedicated to the study of the physics of strongly interacting matter produced in nucleus-nucleus collisions. The design of the experiment was optimised to determine, in the laboratory, the properties of quark-gluon plasma, the primordial state of matter that prevailed for a short time after the Big Bang. The letter of intent was also the first official document in which the ALICE acronym for “A Large Ion Collider Experiment” was used. During the 25 years that followed, a strong collaborative effort was put into conceiving, designing, building and operating the ALICE experiment. This venture was rewarded with unprecedented advances in the measurement of the physical properties of quark-gluon plasma and with the discovery of new phenomena, from the observation of a completely new regime for the formation of open and hidden charm hadrons to the detection of collective effects and strangeness enhancement in small colliding systems. Spokesperson Federico Antinori opened the jubilee event, before four speakers – Emanuele Quercigh, Jürgen Schukraft, Chris Fabjan and Luciano Musa – talked about the conception, infancy and build-up of the ALICE experiment and the plans for its future, respectively. Back in October 1990, at the Aachen workshop, ideas about nucleus-nucleus collisions and a possible heavy-ion physics programme at the future Large Hadron Collider had been discussed. A couple of months later, some 60 physicists gathered at CERN to initiate “a serious experimental effort towards a heavy-ion detector capable of measuring ultra-relativistic heavy-ion collisions at LHC energies” and the so-called Heavy Ion Proto Collaboration (HIPC) was created. This would later evolve into the ALICE collaboration. In March 1992, at the “Towards the LHC Experimental Programme” meeting in Evian, scientists put forward an expression of interest. The letter of intent followed in 1993 and the technical proposal in 1995. The dedication demonstrated by the international collaboration in building and installing the detector is still a key feature of the ALICE collaboration, which is not only harvesting the results of the work done throughout the past 25 years, but also laying the foundations for important future measurements, thanks to the upgrade activities and long-term plan. The presentations were followed by celebrations, including projections of historic pictures portraying the ALICE members and the detector. Attendees included collaborators and invited guests, who reminisced and exchanged anecdotes of the experiment’s history, and toasted a fruitful continuation of activities.